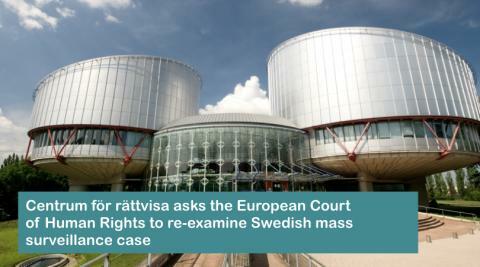 Centrum för rättvisa has requested that the European Court of Human rights elevates the case of Centrum för rättvisa v. Sweden, concerning Sweden’s mass surveillance program, to its Grand Chamber, which is the European Court’s highest formation. The Court recently held in an initial judgment that the Swedish surveillance system, while giving cause for concern with respect to possible abuse of the right of individuals, still met the minimum legal safeguards that govern the use of the bulk interception of electronic signals for national security purposes. The case is now pending before a panel of the Court, which decides whether the case should be referred to the Court’s Grand Chamber. “The right to privacy is one of the defining human rights challenges of the digital age. We have asked the Grand Chamber of the European Court of Human Rights to clarify how mass surveillance activities should be safeguarded against abuse in order to protect the right to privacy”, says Fredrik Bergman, Head of Centrum för rättvisa, a Stockholm-based public interest law firm. On 19 June 2018, the Court, sitting as a Chamber of seven judges, delivered its judgmentin the case of Centrum för rättvisa v. Sweden. The Court held that whilst the Swedish system of mass surveillance, or “bulk interception”, was not in violation of the right to privacy protected under Article 8 of the Convention, it nevertheless gave “some cause for concern with respect to the possible abuse of the rights of individuals”, with “scope for improvement”. This was the first time that the Court addressed the question of which minimum legal safeguards should govern bulk interception regimes designed exclusively for national security purposes. Shortly after the judgment was issued, another section of the Court issued a different judgment on the mass surveillance regime in the United Kingdom, finding it in violation of Article 8 of the Convention (Big Brother Watch and Others v. the United Kingdom, 13 September 2018). develop the minimum safeguards governing inter-state intelligence sharing. A panel of five judges of the Court will now decide whether the case should be referred to the Grand Chamber. In order for the panel to refer the case to the Grand Chamber, the case must raise a serious question affecting the interpretation or application of the Convention or a serious issue of general importance. “This case raises important issues of law that require an authoritative determination by the Grand Chamber. European states face serious threats from terrorism, criminal activity, and hostile actors. Interception activities form part of how some European states counter these threats. However, without proper safeguards, the use of mass surveillance risks intruding upon the very basic fundamental rights and freedoms of the societies that such surveillance seeks to protect,” says Fredrik Bergman. The Chamber's judgment in the case of 19 June 2018 will become final if the panel decides not to refer the case to the Grand Chamber. Centrum för rättvisa (Centre for Justice) is a non-profit public interest law firm based in Stockholm, Sweden, that seeks to protect and promote individual rights and freedoms. Centrum för rättvisa represents individuals in public interest litigation proceedings, runs educational outreach programs, and participates in the public debate on civil liberties. Hovrättsassessor från Svea hovrätt. Masterexamen i konstitutionell rätt från Harvard Law School. Läste juridik på Uppsala universitet.